As part of our celebration of National Poetry Month, we're featuring the work of a wide variety of poets, including Maya Angelou! Born Marguerite Johnson in 1928, Maya Angelou grew up in Missouri and Arkansas. Her childhood was far from charmed, as she recounts in the first and best known volume of her autobiography, I Know Why the Caged Bird Sings. At seven, she was raped by her mother's boyfriend, a man who was later murdered by her uncles for his crimes. The trauma of these events left Angelou so withdrawn that she didn't speak for five years. During this time, literature became her escape. She read voraciously, devoring the works of African American authors and poets like W. E. B. Du Bois, Paul Lawrence Dunbar, and Langston Hughes, as well as the work of white authors. Slowly drawn back into speech, by the time Angelou entered high school, she was at the top of her class. She took courses in dance and theatre, but after graduation and the birth of her son, she found herself working a series of odd jobs to make ends meet. While singing at a nightclub in San Francisco, Angelou caught the attention of talent scouts and earned herself a place on the cast of the touring production of Porgie and Bess. Her new stage career took her to New York, where she joined the Harlem Writers' Guild and first encountered noted civil rights leaders of the day. It was a cause she would champion for the rest of her life. 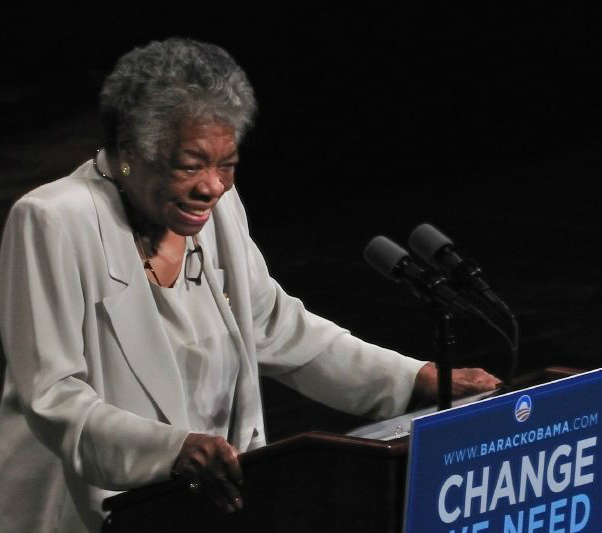 Angelou worked for both Malcolm X and Dr. Martin Luther King, Jr., and was the northern coordinator for the Southern Christian Leadership Conference. In the early 60s, Angelou moved to Egypt, and then to Ghana, where she made her living as a writer and editor for local English-language newspapers. When she returned after years abroad, friends encouraged her to continue with her writing. Though initially reluctant, Angelou eventually agreed to write an autobiography. I Know Why the Caged Bird Sings, released in 1969, was an immediate success and was even nominated for a National Book Award. Though Angelou would continue to write autobiographical works nearly until her death, after the publication of her first book, she also began to publish volumes of poetry. These were rooted in her work as a civil rights and social justice activist, her experiences as an African American woman, her talents as a singer and performer, and in the oral traditions of African American storytelling. Just Give Me a Cool Drink of Water ‘fore I Diiie was nominated for a Pulitzer Prize in 1972, and in 1993, she was commissioned to write the first inaugural poem for the inauguration of Bill Clinton as President of the United States. Even as she continued to write poetry and autobiography, Angelou worked in film, television, and onstage. She wrote essays, plays, and children's books. In 1982, she took a positon as Reynolds Professor of American Studies at Wake Forest University in North Carolina. Her broad-reaching lifetime achievements were honored in 2000, when she received the National Medal for the Arts, 2010, when she received the Congressional Medal of Freedom, and in 2013, when she received the Literarian Award. Maya Angelou died in 2014 at the age of 86.